Businessman sitting on street bench and listening music on cellphone. 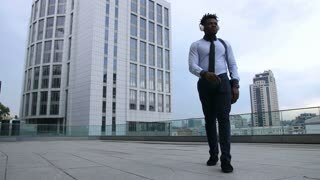 Positive handsome african american entrepreneur celebrating successful agreement and dancing in city street while listening music with headphones. Cheerful carefree businessman dancing outdoors.